When it comes to the learning industry, the term “Instructional Design” is a no-brainer. So, you might ask, “What is the deal with Instructional Technology?” Instructional Design is a key part of Instructional Technology; without Instructional Design, Instructional Technology would not exist. In the program I graduated from, students are taught instructional design processes, theories, and models. Instructional Design is woven into every class; in fact students follow ID processes, and develop eLearning for real clients. Technology is merely a deliverable method, and I happen to have been shown some great ways to use technology to create and deliver learning using Instructional Design. Technology is here to stay, and it is only getting bigger. In my Wideo project, I outlined a few reasons why it is important instructional designers understand technology. Why is understanding technology important for instructional designers? Designing for Technology: Nowadays learning is not just in the classroom. Learning is on the move; learners are mobile. The same deliverables that were built for PCs do not always translate well to tablets and phones. Time and Cost: Understanding how much work it takes to go into a project will better help you negotiate costs and plan accurate timelines. Evolution of Technology: Technology is evolving at a fast pace. There is more software being developed, and updated for creating training deliverables. With a diversity of software to create learning, there is the opportunity to design innovative ways to teach learning objectives. Speaking the language: Even if you are not developing a deliverable like eLearning, chances are you are probably working with a developer. Understanding and speaking the language used by the developer will cause less confusion and error in the long run. This entry was posted in eLearning, Instructional Design, technology and tagged eLearning, instructional design, instructional designers, Instructional Technology. Wideo is a web-based animation tool, created by the company Wideo LLC. Wideo’s headquarters is in Buenos Aires, Argentina. I have been using the free version of Wideo for about two weeks now. I absolutely love Wideo! I started playing around in the tool mainly because I thought it looked interesting, and because it is free. Wideo is an extremely intuitive tool. The main parts of the tool are the timeline, and the stage. You add objects to the stage, add animations to the objects, and arrange the animation points on the timeline. In Wideo you can upload your own content or use their pre-set content. I don’t know if this is just in the free version of Wideo, but here are a few things I wish were different. I think it might be nice to have more advanced audio controls, like an audio timeline and editing capabilities; that way voice could be added strategically. For some reason when I try to group objects an animate them things get a bit screwy, like objects disappearing in the middle of an animation. This entry was posted in Instructional Design, technology and tagged animation, instructional design, Instructional Technology, wideo. Say, you don’t have the resources to design your next eLearning prototype, like: time to learn graphics software, money to buy images, or a multimedia team to create graphics for you. You can create a prototype for your eLearning very easily and for free! As long as you have: the internet, Microsoft PowerPoint, and a little imagination, you can create a slick looking prototype for your eLearning course. You will get started on your eLearning prototype (I hope! ), after you have created a project plan document, identified the instructional goals for the learning, conducted thorough analysis, written your performance objectives, developed any assessment tools, finished the creation of a storyboard, and at some point created a log of your clients’ wishes. You probably developed your storyboard in Microsoft Word, but maybe you have not added images yet. There are a few places to get free image sources online or in some cases you can get them through PowerPoint, or create them in PowerPoint. In one of my prototype projects, I created a background for the eLearning in PowerPoint. My eLearning theme is a classroom environment. 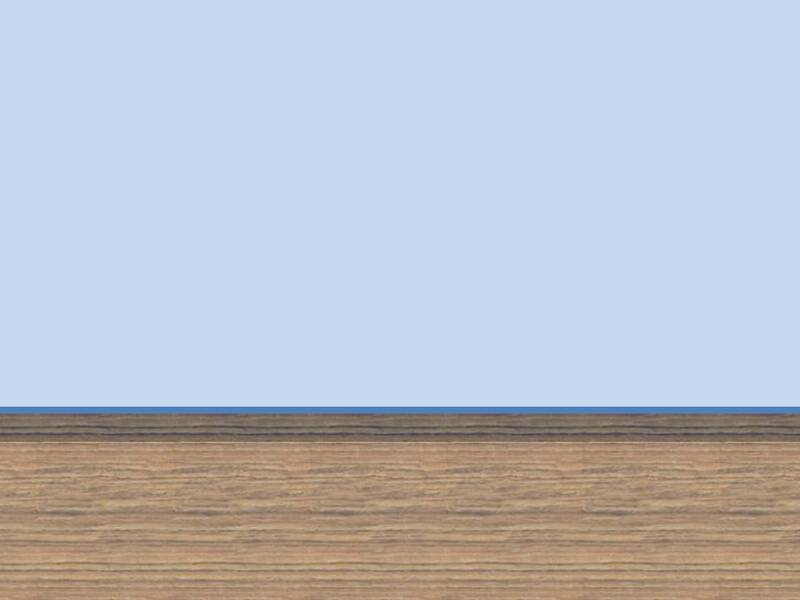 I used a plain blue background as classroom walls, and I created a floor with a rectangular shape, with wood texture added. I simply used the same background on every slide, and then added classroom elements according to each screen’s detail on the storyboard. Prototypes can either be functioning, or they can be more of a plan or layout of what should work. You should make sure the eLearning software that you are going to be using will support all of your prototype’s functions. As you can see in the image above on the classroom background, I added a chalkboard, a question mark chalk image, and a different font for the chalkboard. All of the images were free for use. 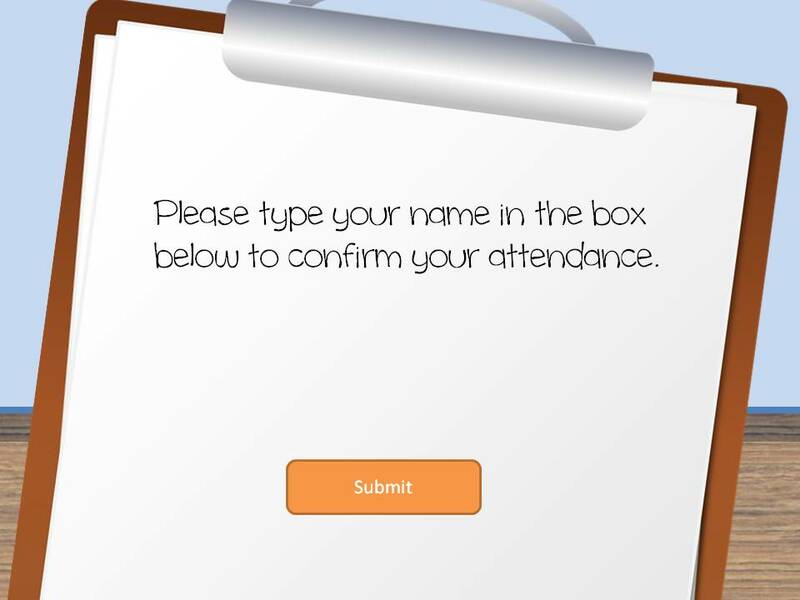 The image above of the clipboard has a blank space for where the box for a text input field would be. 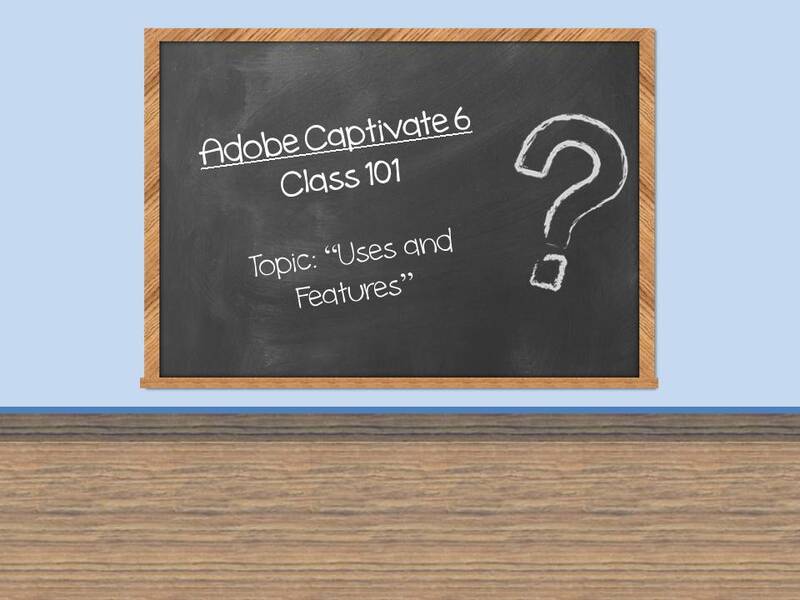 I planned on creating the eLearning in Captivate, after creating the prototype in PowerPoint. I knew that Captivate has boxes for text input fields, so it was all right to add the box. I also knew I could add advanced actions to the text input field and a text field. On the slide with professor Mary after the learner entered their name, the space after “Hi, ” would populate what the learner entered in text input field on the clipboard. eLearning Tip: I already tested my eLearning, and knew it would work before I prototyped. Make sure you know the eLearning you are creating will work on your audiences’ computers or mobile devices. Test first! 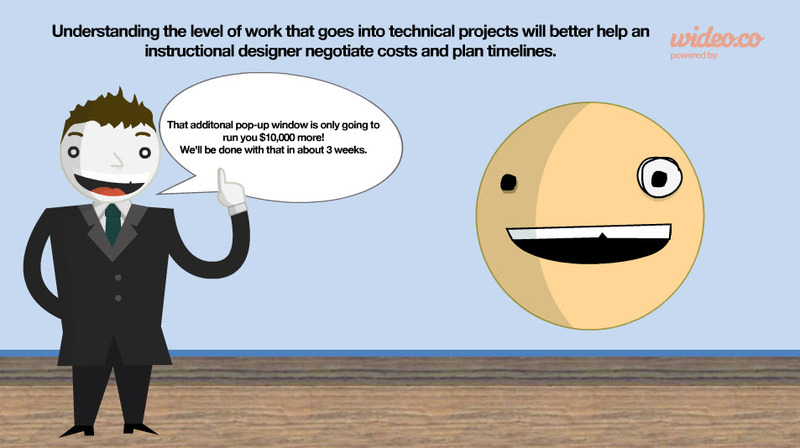 This entry was posted in eLearning, Instructional Design, technology and tagged eLearning, Prototype. I created the above infographic in easel.y, http://www.easel.ly/ with icons from The Noun Project, http://thenounproject.com/. 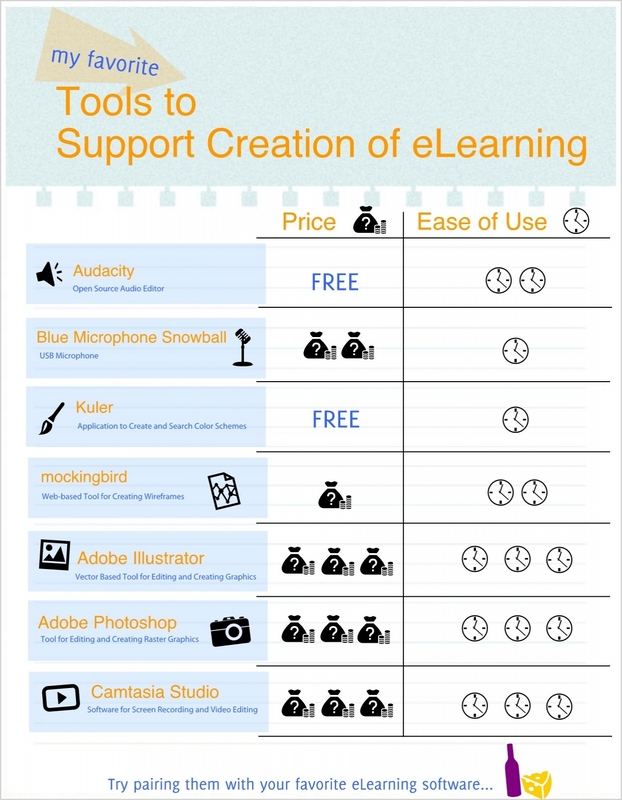 The infographic includes some of my favorite tools to support the creation of eLearning. This entry was posted in eLearning, technology and tagged design, develop, eLearning, tools.